Suspected Militants Strike Afghan Interior Ministry, Exchange Gunfire With Police : The Two-Way The attack appears to be the latest in a series claimed either by the Islamic State or the Taliban in recent months that have targeted government buildings, checkpoints and hotels. Security personnel arrive at the site of an attack in the Afghan Interior Ministry in Kabul, Afghanistan, on Wednesday. 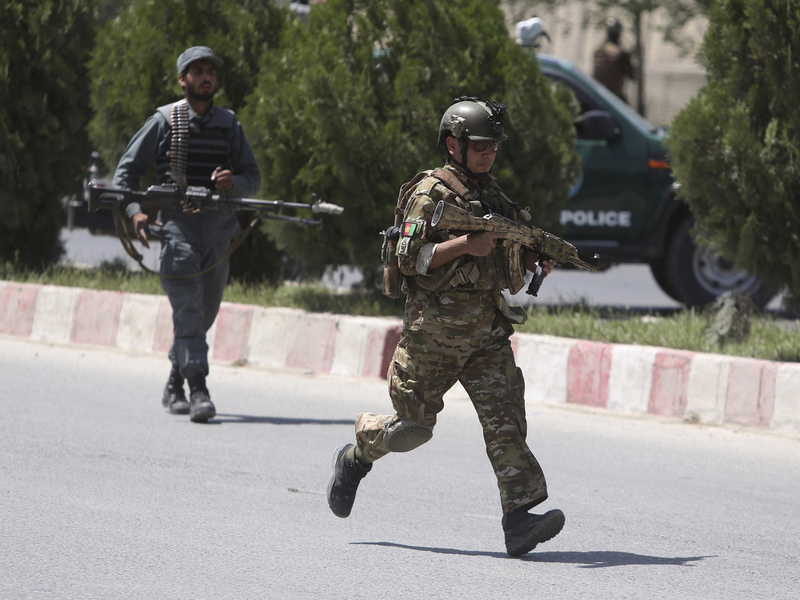 An apparent car bomb and an exchange of gunfire between militants and security forces near the Interior Ministry building in Kabul is the latest in a series of attacks in the Afghan capital in recent weeks. There was no immediate claim of responsibility for the attack, but previous attacks — often following the same pattern of a bombing followed by a firefight – have been claimed variously by the Islamic State or the Taliban. Reuters reports that two loud explosions and gunfire were heard in proximity of the Interior Ministry compound and that police inside reported that the facility was under attack by militants. Meanwhile, The Associated Press reports that a senior police official says at least one of the explosions was a car bomb. Afghanistan has witnessed an upsurge in violence in recent months. In January, a Taliban attacker drove an explosives-laden ambulance into the heart of the capital, killing more than 100 people and wounding as many as 235. The following day, 11 soldiers were gunned down at a military academy in Kabul. There have also been numerous attacks on government buildings and at police checkpoints. In recent days, security in the capital has tightened after the government warned of "complex attacks" by the Taliban on government or foreign installations, according to AP. "Provincial cities have also been hit as the Taliban, seeking to reimpose hardline Islamic rule, have stepped up fighting across the country since they announced the beginning of their annual spring offensive in April. The latest violence coincided with a U.S. government report that found few signs of progress in Afghanistan this year, with fighting spreading and hundreds of casualties from militant attacks."